Microsoft is bound and determined to get rid of Control Panel in Windows 10 and replace it with Settings. But not so fast. Many Control Panel items are still not included in settings, so it looks like Control Panel will be around a big longer. And, if you use Settings a lot you’ve probably notice when you click certain items in Settings, you end up in Control Panel. Microsoft will eventually get everything moved out of Control Panel and into the Settings app, but as of this writing, they are nowhere close to getting that done. Those of you with Windows 10 Creators Update and Fall Creators Update have noticed that Control Panel is missing from the Win X menu (right-click the Start button – that’s the Win X menu, which can also be launched by pressing the Windows Key + X). You can access Control Panel without a shortcut. Just press Windows Key + R , type CONTROL in the run box and press Enter. Control Panel will open. While Control Panel is open, you can right-click on its icon in the taskbar and choose “Pin to taskbar” if you want a permanent shortcut to Control Panel on your taskbar. Today, we’ve made a reg file that will add Control Panel (with options) to your desktop right-click menu. See? If you download and run our reg file (link below), you’ll have Control Pane, and the options shown above, on your desktop right-click menu too. You can download the reg file that will make this happen, by clicking this link. Once you’ve downloaded it, unzip it, then double-click it on the file named ControlPanelContextMenu.reg . 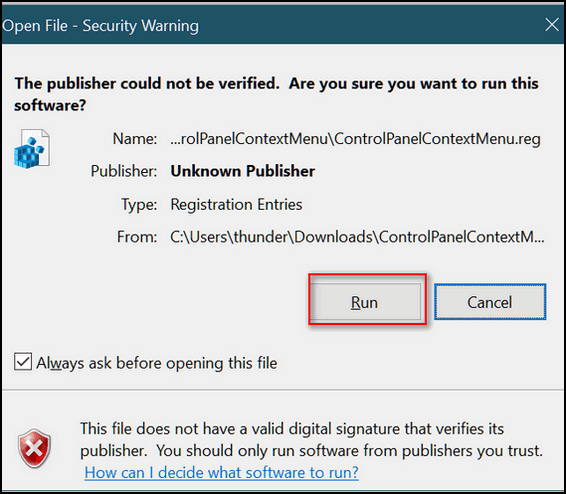 You’ll need to click Yes on the warning to allow the Registry Editor to open. Then you’ll get another warning telling you that you can really mess up your computer monkeying around in your registry. If you want Control Panel on your desktop right-click menu, click “Yes”. If you did everything according to the instructions above, from now on, when you right-click on your desktop, you’ll see Control Panel in your right-click menu with the option so open Control Panel in Category View, Large Icon View, or as a list. We prefer Large Icon View. Our 2017 Christmas Special prices are good through Sunday December 17, 2017! You still have time. Get a great deal and help support our small business too! Get 3 Cloudeight Direct Computer Repair keys for just $89. You save $61. Get Ashampoo Backup Pro 11 FREE With Any Emsisoft Purchase! 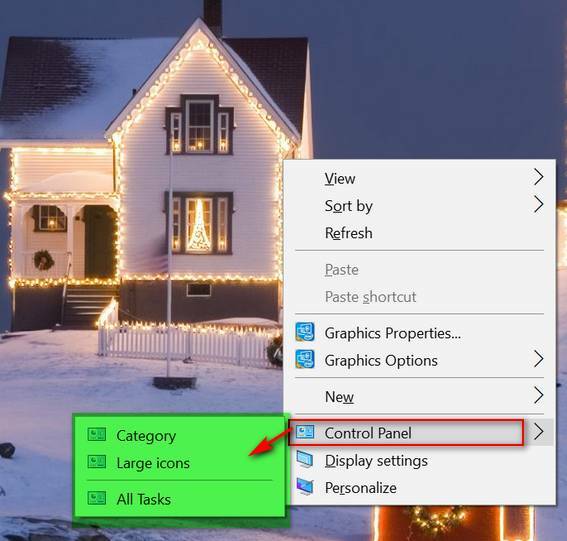 Put Control Panel on Your Desktop Right-Click Menu – Thank you so much! What a wonderful tip – I use Control Panel all the time – this makes it so much easier….the reg file worked perfectly. It was very easy to do and I will use it a lot. Thank you. HOORAY HOORAY…fantastic tip for getting to the control panel with a simple right click! Very easy to accomplish because you SHOW and TELL I just love all the wonderful shortcuts and valuable info you give us. Thanks once again and have a most joyful Advent and Merry Christmas! Thank you so very much for this help tip. It is awesome I don’t know why Microsoft has to make so many changes to something that is good and always works. Thank you both for all you share with your customers and all the things you help them do.